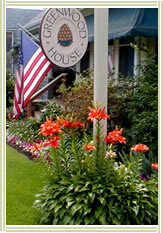 Your home away from home, Greenwood House, is conveniently located in a beautiful, turn-of-the-century neighborhood, only four blocks from the Vineyard Haven ferry dock and public transportation and two blocks from the edge of the village. Click here for online directions Seasonal passenger ferries sail to the Island from New Bedford, Falmouth, and Hyannis. A year-round car and passenger Steamship Authority ferries sail from Woods Hole. If you plan to bring your car, be sure to contact the Steamship Authority for reservations as soon as possible at 508-477-8600. Remember, a car isn't really necessary during the Summer Season, especially if you're coming for less than 5 days. The Island has an excellent public transportation service and tour busses are available. Also, you can rent cars, bicycles and boats on the Island. Year round bus service is available from Logan Airport and Boston's South Station to the Woods Hole terminal. BY CAR: From the Vineyard Haven ferry dock, you'll be directed to the left. Proceed to the stop sign and turn right. Take the next right onto Main Street. Take a left on Greenwood Avenue. We're located three buildings down on the left. ON FOOT: Walk up Union Street. Take a right on Main Street. Take a left on Greenwood Avenue. If you have any questions, don't hesitate to contact us 508.693.6150 or at [email protected]. Copyright© Greenwood House, all rights reserved.